Your child's teacher will look great and feel great in this comfortable Personalized Teacher T-shirt. 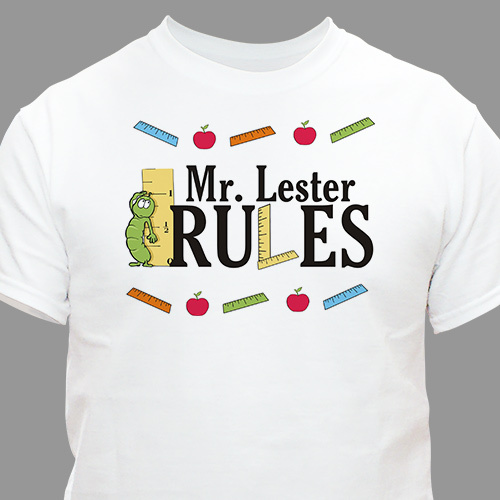 This My Teacher Rules T-Shirt makes it easy to make your gift personal. Our Personalized T-shirt is Available on our premium white 100% cotton T-Shirt, machine washable in adult sizes S-3XL. Includes FREE Personalization! Personalized your Teacher T-shirt with any name. Buy Personalized Gifts For Teacher Today! Super cute. Good quality and size measurements. Take a peak at our entire collection of Personalized T-Shirts. Our Personalized T-shirts are perfect for Teacher Appreciation Gifts, Christmas, Mother's Day, Father's Day, Sweetest Day, Valentines Day & Birthdays. Create a custom T-shirt for someone in your family today. Mom, Dad, Sister, Brother, Grandma or Grandpa will love this wonderful t-shirt which you have personalized just for them. GiftsForYouNow.com offers many unique personalized keepsakes for your friends. Some of our most popular Friendship gifts are our Personalized Friendship Frames, Friendship shirts & of course our Personalized Friendship Keepsakes.